It's the Rheo Thing: What's in a Name? What's in a Number? If you've ever worked with certain polymer additives such as antioxidants, UV absorbers, photoinitiators, etc., you probably have noticed a pattern. Take for instance, Irganox 1010, a product of Ciba. As an temporary aside which will later not be an aside, it's a pretty complicated molecule until you look at the structure a little bit. First, you can see that there are four identical arms. As such, this image simplifies the matter. 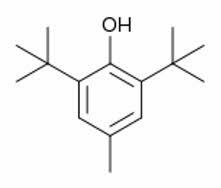 Looking at the left end, you may recognize the butylated hydroxytoluene segment, aka BHT: a well known antioxidant. So know we can see that Irganox 1010 is simply 4 molecules of BHT bonded to a central molecular segment (I suspect that it is pentraerythritol.) BHT by itself is too volatile and mobile to be very useful in durable plastic applications, but when modified like this, it will be much more effective in the long run. But getting back to my original intent, I don't know for sure that Ciba first starting marketing this product, but you will see numerous products from other companies that have their own name for the product, but kept the 1010 number with it, such as Plaox 1010, BNX 1010, Songnox 1010 and Westco 1010. I've no experience with trademark laws, but it seems as if Ciba, or whoever first developed these products, could protect their name - Irganox - but not the number 1010 (nor the combination of name and number). 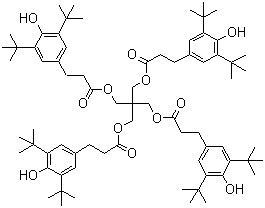 This pattern exists with more than just the 1010 molecule. It clearly is more than a coincidence. In some ways, this is a good things as it simplifies the sourcing of alternate materials, but it also oversimplifies the situation by implying equivalence. Since we do a lot of work here at Aspen Research on degradation of polymers, we've had the opportunity to examine in details many of these "equivalent" products and found them to be not so "equivalent". The biggest culprit is that the reaction binding the BHT to the central framework is not as well completed as it should be - i.e., there may only be 3 BHT moieties instead of 4. That 4th BHT molecule is actually in there, but it is footloose and fancy free to disappear rather than stick around where it is needed. The bottom line is beware of implied equivalence - analyze and test the materials to prove to yourself the equivalence.